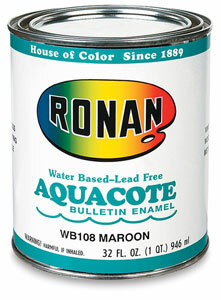 Aquacote is a waterborne, low odor, high gloss, solid covering, acrylic Bulletin Enamel formulated for graphic arts and maintenance applications. It is lead free, fast drying, easy brushing, environmentally friendly, VOC compliant and easy clean up. It produces a durable, flexible, weather resistant finish and exhibits excellent adhesion to wood, steel, concrete, galvanized metal, aluminum and treated or untreated vinyl. It is recommended for painting backgrounds, lettering copy and graphics on signs, outdoor advertising billboards, metal highway signs, commercial signs and vinyl banners. Metal structures must be primed with Ronan Prime Lock DTM Primer. Dry Time: @ 70 F. and 50% Relative Humidity: Dries to touch - 30 minutes; to handle - 2 hours; to recoat - 8 hours. Will take longer to dry under colder or more humid conditions. Wait 8 hours before rolling or folding vinyl signs. Application Method: Brush, roll or spray.